Booking Holdings (BKNG) is a leading provider of travel accommodations and restaurant reservations. The company has six primary brands: Booking.com, Priceline, KAYAK, OpenTable, RentalCars.com and Agoda. A handful of those properties were acquired, with the most notable example being the 2005 Booking.com deal for $135 million (widely considered one of the best acquisitions in internet history). The company also owns a minority interest in Ctrip, the leading online travel agency (OTA) in China, as well as investments in companies like Didi Chuxing, Grab and Meituan. 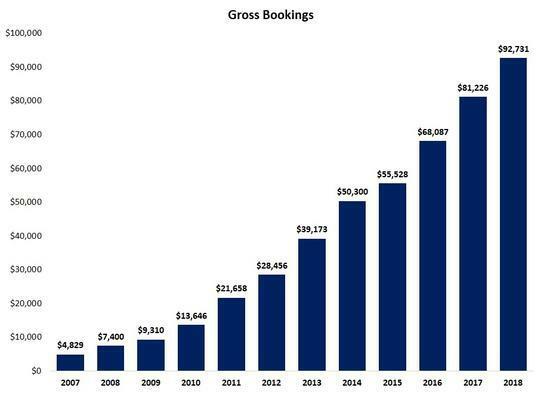 As shown below, Booking has experienced impressive growth over the past decade, with gross bookings across the company's properties reaching nearly $92.7 billion in 2018. In 2018, customers booked 760 million room nights through Booking's properties. That's up roughly 180% from 2011, good for a compounded annual growth rate of 27% (over the same period, gross bookings increased at a 23% CAGR). The flow from gross bookings to the company's income statement has been fairly stable over time, with every dollar of bookings generating roughly fifteen cents of revenues and roughly six cents of operating income. It's worth noting that Booking has a much larger business throughout Europe than in the U.S. (primarily attributable to Booking.com, which accounts for the "substantial majority" of revenues and operating income). This is important because the European hotel market is more fragmented than in the U.S. (and with less dominant chains). The result is that Booking, the leading OTA in Europe, has a strong hand in that market (as CEO Glenn Fogel noted recently, "The larger the hotel, the more sophisticated the hotel, the less value we bring."). A significant portion of Booking's operating expenses are related to performance advertising and brand advertising. The company's performance advertising expense is primary related to traffic acquired from online search engines like Google (GOOG)(GOOGL), as well meta-search and travel research sites like TripAdvisor (TRIP). Over the past few years, Booking has emphasized brand advertising in hopes of building consumer awareness and generating more direct traffic. "Our performance advertising expense has increased significantly and our online performance advertising efficiency has declined in recent years, a trend we expect to continue." Booking is clearly incentivized to invest in driving direct traffic to its properties. In 2018, brand marketing expense increased 17%, compared to a 7% increase in performance marketing. Based on what management has said, I would expect this to continue (and it appears to be working -- direct traffic accounts for more than half of the business and is growing faster than the average). Adjusted net income in 2018 increased 16% to $4.4 billion, with non-GAAP earnings per share climbing 20% to $92.6 per share. The share count declined 4% in 2018 due to $6 billion of repurchases, by far the highest amount in the company's history (the prior record was $3 billion in 2015). Booking has a strong balance sheet, with roughly $6 billion in net cash and investments. In addition, the company generates significant free cash flow (FCF conversion has consistently been above 100%). Based on 2019 guidance, the company expects to repurchase at least $4.5 billion of stock over the next 12 months - equal to more than 5% of the current market cap. Management expects bookings and revenue growth in the mid-single digits in the first quarter, well below the 2018 results (that includes a headwind from the shift of Easter). In addition, they expect low-single digit EBITDA growth (adjusted for Easter and currency) as a result of growth investments. That headwind should abate in the back half, with EPS expected to climb low double digits. My sense is that investors should be prepared for weak results in the short term (and the stock price may react accordingly). With that said, I do not think this reflects a narrowing of the moat or any real change in the long-term growth opportunity for Booking. My research leads me to believe the company's dominant position, most notably in the European OTA market, is sustainable. Combined with the tailwind attributable to the shift in consumer spending from traditional offline channels to online channels, as well as the significant cash generation that enables Booking to repurchase a lot of shares and make strategic investments, the company has a long runway of attractive earnings growth ahead (by my math, the company has somewhere around 10% share of the global hotel accommodations market). Near $1,740 per share, Booking trades around 17x trailing free cash flow. I won't go into the assumptions in my model, but I think the company is worth more than $2,000 per share. I have some questions about its capital allocation plans, but that is mitigtated in the short term by repurchases at prices that I view as attractive. For those reasons, I have decided to make an investment in Booking.